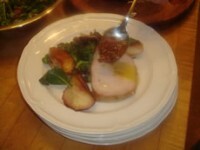 Here for you is my interpretation of their recipe for Pork with Nectarines which was submitted by Bruce Hill of PICCO in Larkspur. It’s so easy and delicious! When you buy pork, look for a pale grey or pink color. The tenderloin is a small long piece (about 1 lb.) which can be coated with olive oil, salt, and pepper and grilled over a charcoal fire or gas grill. What I did for this recipe was brown a 3-lb. 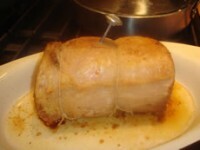 boneless loin roast and then finished it in the oven. Either way the meat is done when an instant thermometer inserted deep into the roast reaches 140 degrees, or when the meat begins to shrink. Remember to always cut the meat against the grain not with it. 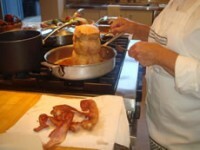 To make the vinaigrette, in a 10-inch saute pan, cook the bacon until crispy. Remove and let dry on paper towels. Pour off all but two tablespoons of the bacon fat and immediately toss in the minced shallots. Cook stirring over medium-high heat until soft, but not brown. Stir in the sugar, red wine vinegar, and a splash of olive oil. Transfer this warm mixture to a metal bowl. Let cool; then, chop the bacon and add to the dressing with the rest of the olive oil. To cook the pork tenderloin, preheat a charcoal fire or gas grill. Rub the pork and nectarines with olive oil and season with salt and pepper. Grill the pork first, and then the nectarines over high heat until brown on all sides, about 5 minutes. Remove the nectarines and keep warm. Then, close the cover of the grill and let the meat cook, until it is firm to the touch, about another 10 minutes. To cook the pork roast in the oven, do not wash the saute pan, but rather brown the roast in the pan on all sides, adding a little more oil if necessary. Remove the roast and put it in a small roasting pan in a preheated 400 degree oven. 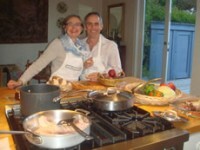 It should be cooked in another 15 to 20 minutes, or until a thermometer inserted in the meat registers 140 degrees. 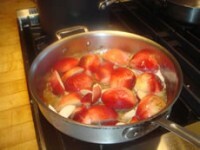 In the same saute pan, cook the nectarines, sprinkled with salt and pepper, until lightly golden on the cut side. To serve, place the metal bowl of vinaigrette over a flame briefly to warm, then, pour two thirds of the vinaigrette over the watercress in large bowl. 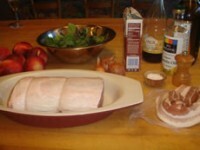 Place the dressed watercress on four warmed plates; partially cover with sliced pork, and browned nectarines. Pour the remaining bacon vinaigrette over the pork.